Michael is bringing us comic art fans a gift. Everything he does is inspired by John Buscema, a truly loved man. Conan from Treasury Edition 19 back cover. By Michael Maikowsky (after John Buscema copied art). Although Big John can no longer create new images or recreate old ones, through Michael, Mr. Buscema's magic can still grace the page. A note from Michael: Fellow CAF member Michel Maillot triggered my interest for those John Buscema recreations. Michel saw my tribute portrait of Big John in issue # 21 of TwoMorrows ´Comic Book Artist Magazine´ and asked me for a copy of my drawing which I sent him along with a cover recreation I had finished just for fun. Original art collection (the ´French Collection´, as I use to call it). Inspired by Michel's compliments, I got hooked and developed the nutty idea to recreate every one of Johnny B. ´s penciled and inked covers, which I guess was my desperate expression of how much I miss the Big Man and his exceptional artistry. A big thank you goes out to artist supreme Joe Jusko who encouraged, promoted and honored me by presenting some of my artwork in his breathtaking gallery. As you can see, I definitely enjoy reproducing those magic images of John Buscema. It's something I find very inspirational and a valuable learning experience! It taught me more about anatomy, composition, dynamics, lighting, spotting of blacks, etc. Than any how-to art book out there. Btw, my recreations are 11x17 and done on quality two ply bristol board, solely inked with a brush. The title logos are hand lettered. To prevent confusion and misunderstandings, the artwork is signed with the usual... Hope I can share some of the love I feel for Big John. 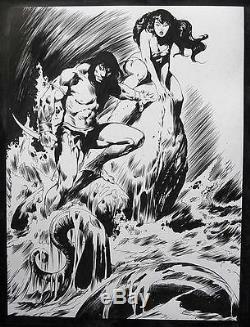 The item "ORIGINAL INKED ART BY MICHAEL MAIKOWSKYafter John Buscemateammate of Red Sonja" is in sale since Sunday, May 08, 2016. This item is in the category "Collectibles\Comics\Original Comic Art\Drawings, Sketches". The seller is "patelnigam" and is located in Des Plaines, Illinois. This item can be shipped to United States, Canada, United Kingdom, Denmark, Romania, Slovakia, Bulgaria, Czech republic, Finland, Hungary, Latvia, Lithuania, Malta, Estonia, Australia, Greece, Portugal, Cyprus, Slovenia, Japan, Sweden, South Korea, Indonesia, Taiwan, South africa, Thailand, Belgium, France, Hong Kong, Ireland, Netherlands, Poland, Spain, Italy, Germany, Austria, Russian federation, Israel, Mexico, New Zealand, Philippines, Singapore, Norway, Saudi arabia, United arab emirates, Qatar, Kuwait, Bahrain, Croatia, Malaysia, Chile, Colombia, Costa rica, Dominican republic, Panama, Trinidad and tobago, Guatemala, El salvador, Honduras, Jamaica, Ukraine.